New signing Laurens De Bock at the end of his debut for Leeds United against Millwall. Picture: Tony Johnson. Leeds United players are hoping a bit of warm weather training can prove the tonic they need as they desperately search to get their promotion hopes back on track. An all too familiar January meltdown has seen Leeds fail to win so far in 2018 and they now find themselves down in tenth place after turning the year in the play-off spots. With a weekend free from football following their FA Cup exit, United have taken the chance to head to Spain for a warm weather training camp this week ahead of next Tuesday’s game against Hull City. In truth the team have not really played any worse in their recent disappointing Sky Bet Championship run than they did when they previously won four matches, but they have issues to address like improving the worst disciplinary record in the division and reacting better to conceding goals. Whether they can solve these things in a little training camp is arguable, but it has to be good for team bonding and head coach Thomas Christiansen sees it as an important week. He said: “We will be away, have time to speak, train and get ready for this next game, an important game at Hull. Hull are also at a low ebb after another defeat last Saturday and go into the game fourth from bottom, but after previously doing well against the lower half teams this season United have now lost to Birmingham City and Millwall during their current poor run so cannot prepare for anything other than a Tigers team at their best. They saw first hand that Hull are a capable team as, by Christiansen’s admission, Leeds were fortunate to beat City 1-0 when the teams met just before Christmas at Elland Road. Since then they have only won once and prospects of improving that record have not been helped by suspension with four players banned for the trip to the KCOM Stadium. Samuel Saiz has four more games of his six-match ban to go and Eunan O’Kane two more to sit out. Now skipper Liam Cooper will be out for the next four fixtures following his second sending off of the season last Saturday against Millwall and Kalvin Phillips will miss two after picking up his tenth booking of the campaign. Add to that the fact that Luke Ayling has been ruled out for the rest of the season with injury and United will be without five of their first team regulars. 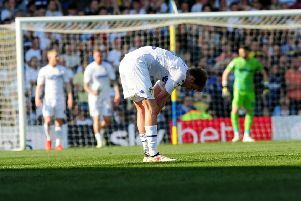 He may be helped by more signings as last weekend’s game highlighted their lack of good enough forwards with no-one on the bench able to come on when Kemar Roofe and Pierre-Michel Lasogga had run themselves into the ground and had to come off. That left the Whites with just the lightweight Pablo Hernandez to play on his own up front for the last 12 minutes and it could be no surprise that they could not respond when Millwall struck late on. A new striker has to be the priority for the rest of the transfer window, although Lasogga’s return to form with a bang with two goals – after he missed two great chances in the first half – has maybe changed priorities on who they aim to bring in. United have added to their squad this month with left-back Laurens De Bock making his debut against Millwall and Adam Forshaw likely to follow suit at Hull, offsetting the feared midfielder crisis they had faced.